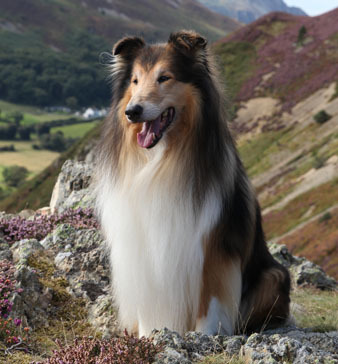 your collie voice is still. We had a lovely day on Saturday 4th April, 2015. The weather forecast was good and so we decided we would get in the car and go back to Sutton-on-Sea for the day. 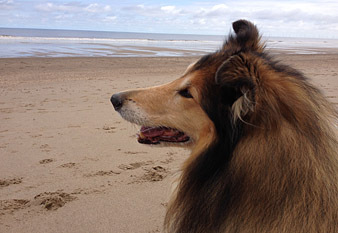 Kerry, Connor and Cara loved to run in circles on the beach, barking in sheer delight as they are accustomed to doing! So it was decided, and off we went. We set-off for home at around 4pm and had an uneventful drive home. We gave the dogs their evening meal and settled down in front of the TV, retiring to bed just after 11pm. Around 11:30 I could hear someone trying to be sick - it sounded like Connor. Out of bed quickly to let him out into the garden, thinking he has ‘picked something up’. But, he wouldn’t stop reaching, and recalling a similar episode with Cara we checked his temperature, it measured 103.8F and because it was so high we called the vet and arranged to meet him at 12:30am. We arrived at the vets and along with discussing an infection the possibility of a torsion was briefly discussed. He was given antibiotic injection and seemed to settle down within 15 minutes. So we went home, putting it down to a tummy bug. We got home and went to bed, but I couldn’t sleep. The thought of a torsion was lodged in my mind. But it couldn’t be? Connor was now sleeping quietly after a long drink. He got up at 2:30am and had another drink and settled down again. I thought all was well and it was just a tummy upset. We were back at the vets at 5:45am, the consent form was signed and we left to await a phone call, whilst x-rays, blood tests and an exploratory laparotomy was performed. At 7:10am on Sunday 5th April we received the phone call. It was not good news. Connor was in such a bad way that in light of the situation we were now presented with and the slim chances of even making it through major surgery, we took the decision that it would be kindest to our beloved friend if he was to be put to sleep whilst under anesthetic. Our hearts sank as we made arrangements to bring his body home. We have lost dogs before, too soon before, and it hurts. But this time it was worse. Probably because we had bred Connor, because ours were the first human hands that held him and because he way the first male we had owned (up until he was born we only had girls). 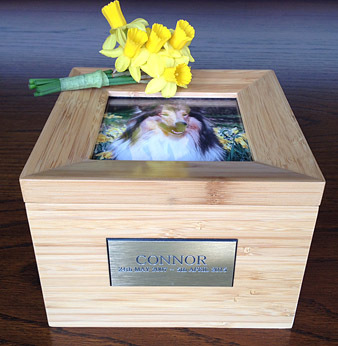 Connor’s ashes are now at home in a tribute box with a posy of flowers. Our only comforting thought is that he is now alongside his mother, Holly. I hope she was there to meet him when he passed away.May he rest in peace and be kept safe until we are all united again. God bless our little lad. A piece of our hearts went with him. 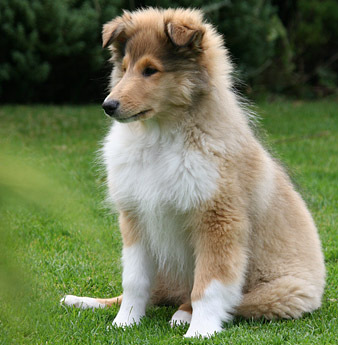 Below: He always was a thoughtful looking pup. 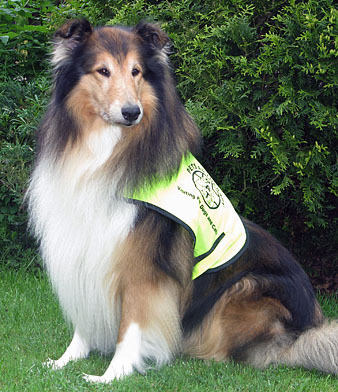 Connor followed in his mum’s footsteps and was a registered Pets As Therapy dog visiting local hospitals. Our last photo of Connor, taken just hours before his passing. We had no idea why he kept gazing out to sea that day. Could he have sensed something?